Being a music lover . . . everything from Gospel to Jazz, there are certain songs that move me in a way, releasing a level of intimacy in the core of my soul that is hard to even express in words. When reviewing a discography of a magnificent legend like Stevie Wonder, it’s difficult to find one song that doesn’t move you at some level. However, one of his least “famous” songs moves me in a way that few songs ever have or will: Stay Gold. The song was originally written for the memorable Francis Ford Coppola movie, based on the coming-of-age novel by S. E. Hinton—The Outsiders. Michelle joined me on my trip into Dana-Farber this week, and let’s just say . . . we livened up the joint—double trouble in the infusion room, (pretty typical of any outing we undertake together). We were our naughty selves . . . laugh-crying in hysteria over things that certainly lightened the heaviness of the environment. I was blessed. She was my little slice of Gold in the moment. I guess my love for Robert Frost and his brilliance kept me company all week, as I pondered yet another poem from memory that always visits me from time to time over the years . . . Nothing Gold Can Stay. Nature’s first green is gold, her hardest hue to hold. Her early leafs a flower; but only so an hour. Then leaf subsides to leaf. So Eden sank to grief, so dawn goes down to day. Nothing gold can stay. Ahhhh. The poem may read almost depressing at first glance, but in fact . . . though the delicate, early golden leaves of spring will turn green, spring turns to summer, dawn will turn to day, youth becomes maturity . . . you can still hold on to the wonder, the “goldenness” of memories and moments, staying gold through each season’s changes. We will find a blessed increase if we embrace the cycle of flower, leaf, bud, fruit—into the full life that includes loss, grief, and change. This is my season of change . . . a winter season where the gold of spring may seem buried, but I can still ponder and reflect on all that I’ve been blessed with. I have truly learned to be content only in Him who gives me strength. 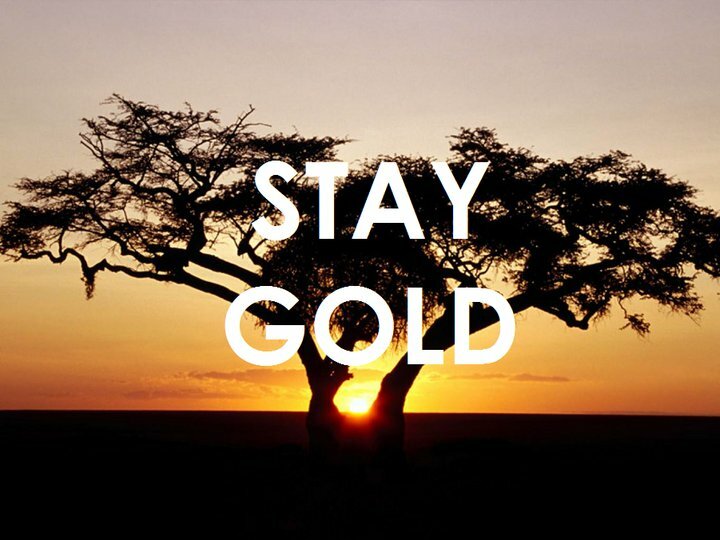 When my content takes a downward turn to sorrow, I need remember to Stay Gold.